ASD Tug 2810 Hybrid cuts fuel and emissions by at least 20%. 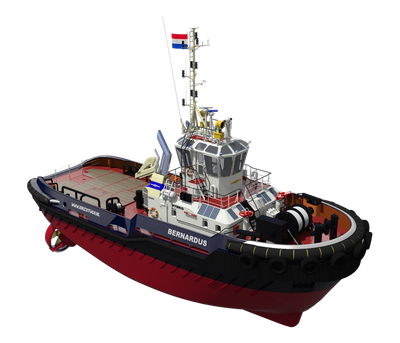 Damen Shipyards has launched its first ever hybrid tug - the ASD Tug 2810 Hybrid - and is proud to announce that Iskes Towage & Salvage will be the launching customer. The signing ceremony took place today (October 23), at Offshore Energy in Amsterdam. 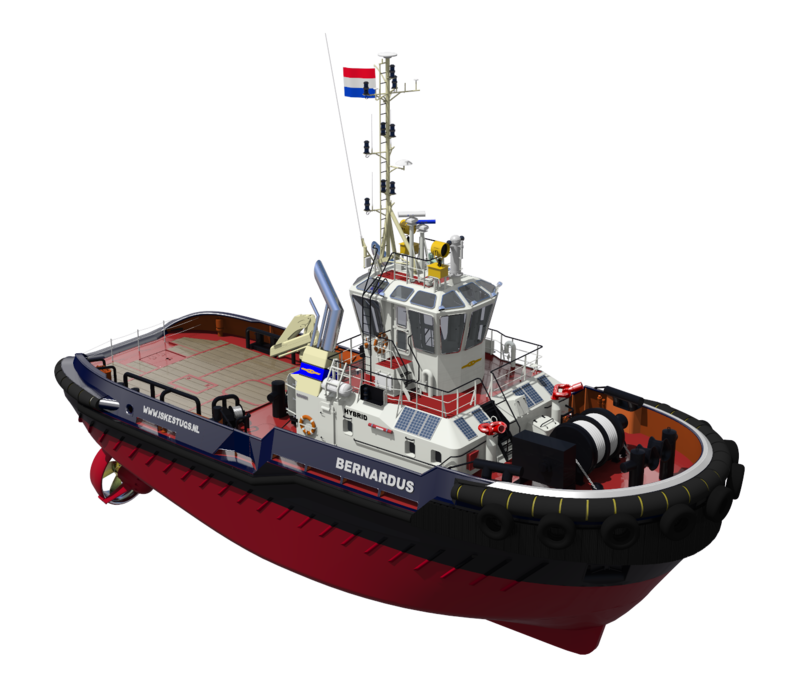 The pioneering Dutch shipyard group is believed to be the only yard worldwide building hybrid tugs for stock. The second hybrid vessel will be available from stock end-2013. Depending on the operating profile of a tug, the ASD 2810 Hybrid, which has a combination of diesel-direct and diesel-electric propulsion, facilitates average fuel savings of between 10% and 30% and cuts local emissions by 20 to 60%. The vessel has a bollard pull of 60 tonnes. Established in 1928, Iskes, which is based in IJmuiden near Amsterdam (The Netherlands), has been operating a conventional Damen ASD Tug 2810 since November 2011. Iskes owner and Managing Director Jim Iskes says: “We already had a very good experience with our existing Damen ASD Tug 2810, which is ideally suited to Amsterdam. We are very happy with its performance and so are the crew; it was a logical move to choose Damen for the Hybrid version”. And indeed, he adds, fuel costs are not getting any cheaper, so the company is making considerable fuel savings as well. “The investment in the Hybrid version is higher but not excessively so. The Hybrid represents an extra investment of approximately 10% more than the regular ASD Tug 2810”, stresses Mr Van Schaik. 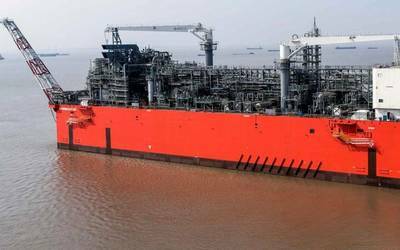 Iskes had been working on its own green solution together with Offshore Ship Designers, looking into the potential of a hydrogen hybrid tug. And earlier this year, the three-year E3-project was completed whereby Damen and its partners had monitored a conventional ASD Tug 2810 operating in the port of Rotterdam. The partners wanted to gather data on a typical harbour tug profile and see what was possible in terms of emissions and fuel cuts. During the monitoring campaign the E3 team found that the average load profile showed that tugs are running inefficiently for most of the time. For up to 80% of the day they can be free sailing, station keeping, running idle essentially, and in turn, this makes them less environmentally friendly and leads to higher operational costs. The diesel electric propulsion system in the ASD Tug 2810 Hybrid delivers enough power to prevent the main engines of the diesel direct propulsion system from running idle frequently or at low loads. During the E3 project Damen’s Research Department made a computer simulation model to analyse various propulsion trains. Damen can use this simulation model to calculate the exact savings that are possible from the Hybrid in each individual case, based on the tug’s operating profile and running hours. Based on the findings and after looking at various battery, LNG, hydrogen and compressed natural gas solutions, the Hybrid emerged. NOx, HC, CO, SOx, CO2 and particles all decrease substantially, as does fuel consumption. As an option, Damen is also offering a battery pack whereby it is possible to shut down all the engines during station keeping, manoeuvring and free sailing at low speeds, making the vessel even more environmentally friendly. Battery packs of 100 kWh each are likely to be provided, which allow the vessel to sail up to 5 knots. The Iskes Hybrid will be incorporating batteries. Mr Iskes stressed that the company was very keen to have a combination of the diesel electric and batteries. “A 100kWh battery allows the vessel to be alongside the quay for eight hours and sail for an hour. And this represents a 10 to 15% fuel saving. Solar panels are added to the deckhouse on the Damen standard version and these are used to charge the 24V battery packs for starting the engines and emergency power for navigation lighting and radio equipment. Other green initiatives on the vessel include LED lighting, and a special paint coating, making the vessel more environmentally friendly and clean for at least five years. Customisation of the Iskes ASD Tug 2810 Hybrid for Anchor Handling includes double drum winches fore and aft, wooden decks and an open stern with towing pins and chain stopper forks.